John Eichberger is Executive Director of The Fuels Institute, a non-profit, independent think tank founded and managed by NACS, the association for convenience and fuel retailing. These policies directly affect the use of vehicle technologies and influence the composition of fuels and energy used to power them. But what outcome will they derive and how might that affect consumers? Biofuel programs seek to reduce carbon emissions and certain criteria air pollutants, but they also serve to support the continued use of internal combustion engines. Greenhouse gas reduction and fuel economy programs similarly target overall reduced emissions, but do not in themselves change how consumers move from point A to point B. 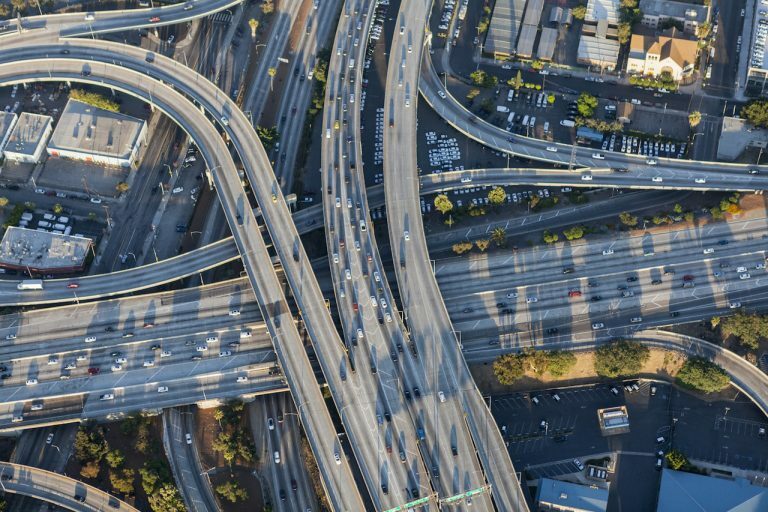 Bans and limitations on internal combustion engines and zero emissions vehicles programs do much more to change the nature of transportation, but do not supplant the number of vehicles on the road. Each holds forth the promise of cleaner air from reduced emissions, but when might they actually have a realistic and measurable impact and what other changes might be required to achieve the other global objectives? Currently, there are no draconian proposals that would require the immediate and complete transition from internal combustion engines to electric vehicles, which means the eventual impact on the market remains to be realized at an undetermined future point in time. Announcements by the United Kingdom, France, and China have set 2040 as the target year for transitioning away from the sale of internal combustion engines – this means that this technology will continue to be manufactured and sold for the next 23 years. In the United States, there is no policy to mandate the transition. In fact, the United States Congress in December 2017 is charting the opposite course by considering a tax reform bill that would eliminate the federal tax credit of $7,500 for consumers to purchase an electric vehicle. What impact might this have? According to Fuels Institute consumer research, 81 percent of consumers who say they would not consider an electric vehicle for their next car cited the high cost of vehicles as a key factor. Without a tax credit, this factor will become a much more significant detractor. For example, Georgia at one time offered an additional $5,000 tax credit on top of the federal credit for the purchase of an electric vehicle and became one of the most successful markets for EV sales. The year after the state repealed that credit and imposed a $200 vehicle registration fee on electric vehicles sales dropped percent. Although 44 percent of the electric vehicles sold through November 2017 were luxury models offered by Tesla, the buyers of which may not be heavily influenced by the tax credit, it can logically be assumed that loss of this credit could significantly compromise sales of other more budget-friendly electric vehicles. But even if the U.S. government were to enact a more dramatic policy to encourage EV adoption, the rate of change in the market will continue to be slow. 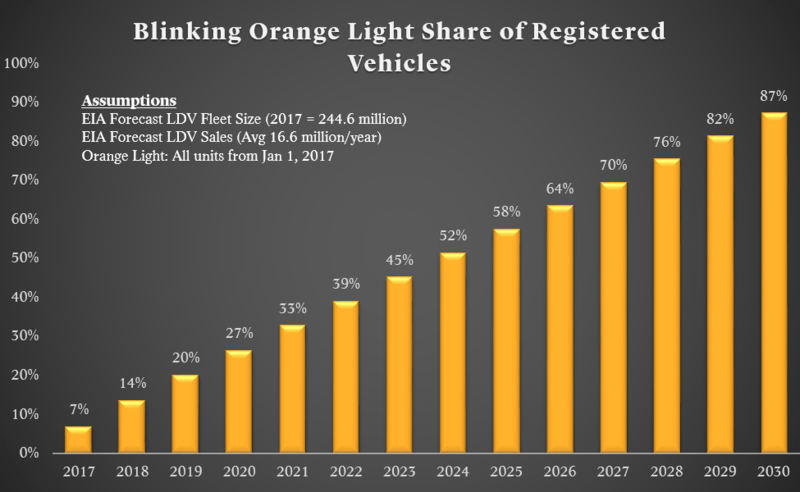 The following chart demonstrates the rate of fleet turnover if every single vehicle sold in the U.S. beginning January 1, 2017, were equipped with something new, such as a blinking orange light on the dash. Even with ubiquitous adoption, it would take about seven years before half of the fleet was so equipped. The U.S. is nowhere close to mandating a 100 percent EV conversion, which means that the time line for fleet conversion is much longer. Let’s now assume that in the absence of a government mandate, but with supportive policies in place, that EV sales were able to grow at a rate of at least 20 percent each year. This would represent a significant rate of growth and by 2035 EVs would represent about 32 percent of total light duty vehicle sales. 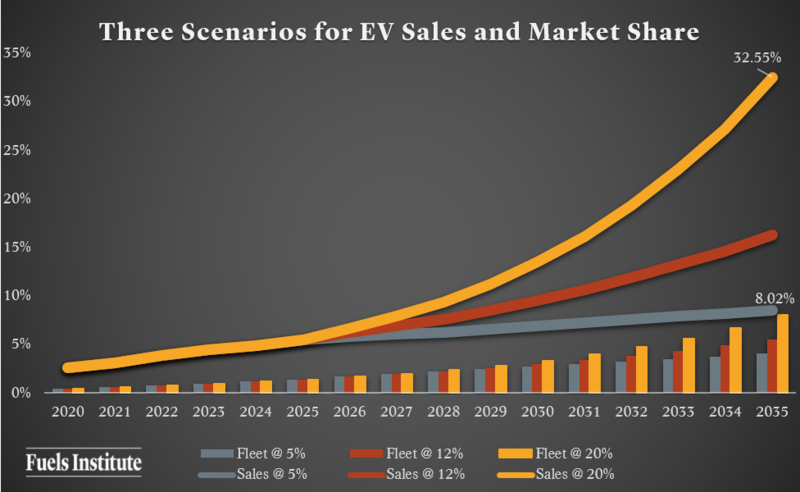 Yet because the denominator of the market (overall fleet size) is so large, by 2035 EVs would represent only 8 percent of the vehicles on the road. Even more, by 2035 EV sales would eclipse 5.5 million units – an enormous volume. But that year, about 11 million non-EVs would still be sold, continuing to dilute the overall market impact of EV sales. The bottom line is, despite altruistic objectives and enthusiastic support, market conversion in the U.S. to a new propulsion and energy system will take time. The transition to an EV market might help address issues such as lifecycle carbon emissions (assuming electricity generation continues to become less carbon intense) and criteria air pollutant emissions, but the perpetuation of personally owned vehicles does nothing to mitigate congestion or reduce traffic-related fatalities. Those focused on these issues believe ride sharing, on-demand mobility services and autonomous vehicles may be the solution to these issues. To this extent, they may be right – but the next step of analysis is how, where and when, and it is here that the projections become very murky. First, what is the realistic timeline for fully autonomous vehicles to amass a significant share of the on-the-road fleet? The media is replete with headlines espousing the advancements in technology and the success of trial programs, but this does not mean the technology is ready for wide scale deployment. There is a point in the future when full autonomy will play a major role in the mobility system, but it could be much further down the road than some would like to believe. The primary challenge I see is the interaction of algorithm-controlled vehicles with the unpredictability of human-controlled vehicles, not to mention regulatory issues affecting their operation. But let’s assume autonomous technology progresses much faster than I anticipate and gains market share in a more aggressive schedule. There is no guarantee that AVs will not be powered by internal combustion engines, leaving unresolved the challenges associated with emissions. Likewise, it is not yet clear whether AVs will necessarily result in multi-passenger travel. Without consumers electing to share physical space within a vehicle with another human being, AVs will simply become yet another vehicle in an already congested travel system. Even within a scheme that assumes AVs will not be personally owned vehicles but rather will be deployed on-demand by a mobility service provider, how will these providers satisfy consumer demand while encouraging sharing? Some have argued that such service providers will deliver an economic value that may be as much as 10 times less expensive than operating a personally owned vehicle. But this presupposes that consumers are 1) fully economically rational, 2) willing to rely exclusively on a third party for their freedom of mobility, and 3) concerned only with getting from point A to point B. When in reality, the reasons for which consumers decide to buy a particular vehicle are extremely complex and are not rooted fully in economics or the utility of transport. There are deep human behavioral elements influencing these decisions that will need to be reprogrammed to convince consumers to elect a shared, on-demand mobility system. Such reprogramming could take generations. Beyond this, if we assume that certain markets are more likely to transition more rapidly towards a service-based mobility system (such as New York, where owning your own vehicle might be more of a burden than not), the transition is unlikely to be identical from market to market. In fact, it is much more likely that certain markets could evolve to an alternative mode of transport for a significant portion of their residents by taking advantage of natural opportunities unique to those markets. From this perspective, we might see New York, Denver, Seattle, and Austin adopt new mobility paradigms that do not closely resemble each other. From such hubs of innovation, mobility strategies might be adopted in other markets and slowly spread through the nation, each adopting its own unique characteristics. Sometime in the future, the systems may begin to adopt enough similar features that they begin to resemble one another and eventually connect with neighboring communities, establishing regional mobility networks. But this will take time. I am convinced that the future of mobility will look vastly different from the system we have today – electricity will become the fuel of choice; autonomy will improve travel efficiency; and safety and mobility services will provide greater utility of vehicles and thus reduce overall cost of transport. Where I differ from many enthusiastic advocates is with regards to timing. The future is still a long way off – we will get there, but we will progress through an evolutionary process. The shots of revolution will continue to be fired and heard around the world, primarily in the form of media headlines, but the fundamental factors that comprise the market in which we live today are too big to be turned over quickly. Persistent pursuit of meaningful objectives, collaboration across market sectors and flexibility in deployment strategies can yield valuable results – but patience will be essential. This article is a good example of why we continue to get transformative change wrong. By definition there will be conflicting trends and even more conflicting policies. In addition, the human mind loves linear change and can’t seem to cope with exponential change rates. Although biofuels are continuing to be actively supported by policy and regulation, I see virtually no technological breakthroughs on the horizon that will meaningfully lower the cost of these fuels. Contrast that with the continuing drops in battery costs. More importantly, the overlay of shared-ride modalities, including Uber and its rivals, means that car utilization is going up. Autonomy will only increase usage. High utilization vehicles benefit significantly more from electrification as their higher capital cost is more quickly amortized and their lower fuel and maintenance costs win over liquid fuel powered vehicles. It is hard to see how liquid fueled vehicles will remain competitive against those trends. Lastly, history shows us that these transformative changes always go more slowly than anticipated just when they are predicted to go fast and then happen much more quickly than expected just when we give up on early expectations. Critical shifts tend to happen between 5-10% adoption levels. This is also where an exponential growth curve tends to begin moving up much more rapidly as change begets more change. With autonomy, we are right at the point where we have seen what is possible and are now expecting rapid adoption to follow. We will be dissapointed as the realities of that adoption will cause it to fail to meet big expectations for as much as a decade more. But, behind the scenes the benefits of automation will continue to grow and become cheaper. Then, just as we are ready to declare completely autonomous driving as a failure, it too wll reach the steep part of its exponential growth curve. The overall growth curves are easy to see and describe. The only hard part is getting the timelines right. We can see it historically in personal computers, flat screen televisions, mobile phones, the Internet, etc., but each new industry has to map its own timeline for when the exponential curve meets its inflection point. Excelente artículo, juiciosamente soportado y dotado de buena información, ayuda a consolidar entradas serias para empresas dedicadas al transporte que buscan argumentos sólidos para soportar en parte sus decisiones … Gracias!